The first reference to the Gibraltar Sea Scouts on record is found in a letter, dated 4th July 1914 from Major O.H. Pedley, the scout Commissioner for Gibraltar, to the Secretary of the Boy Scouts Association in which he informs his that No. 3 and No. 4 Troop ‘are in the process of formation’ and that we shall probably have some Sea Scouts in the near future’. Less than a year later 5th Gibraltar Sea Scouts was raised with Mr. Radcliffe, RN, as its Scoutmaster. The St. George’s day parade that year found Sea Scouts 30 strong and using a discussed guardroom in Ragged Staff as their clubhouse. The following month saw the Sea Scouts parade in uniform for the first time. The occasion was the Empire Day Parade. They paraded with white neckerchiefs cut from bed sheets taken from HMS cormorant, an accommodation ship stationed at Gibraltar. They have retained the white neckerchiefs ever since. A report dated 14th September 1914 states that the Scouts are doing good work in the fortress as messengers at the naval, military and civil works. The Dockyard, regiments, Army Services Corp. Ordinance, Press Censors and the Captain of the Port are all employing Boy Scouts. The Boy Scouts began to mobilise before the Military. Scouting continued to flourish during this period and in June 1916, in response to an invitation from the President of the Spanish Boy Scouts, Gibraltar Boy Scouts marched across the frontier to La Linea to take part in the inauguration ceremony of the newly formed Troop there. A fortnight later the La Linea Scouts returned to visit and were piped all the way from the Frontier to Ragged Staff. By 1919 Mr Wilder RN, Assistant to the King’s Harbour Master, who had previously assisted Mr Radcliffe, and who was responsible for starting the Pipe Band, had taken over the running of the Troop. The Following is an extract from the Headquarters Gazette (Vol. XIII No. 6) dated 14 June 1919. “Captain J E Douglas, RA, our late Assistant Commissioner in Gibraltar, who has returned to England has sent us a very interesting account from the Gibraltar Chronicle of May 5th of a visit of the Gibraltar Scouts to Seville in Spain, at the end of April. Twenty Scoutmasters with nearly 180 Scouts and helpers left in HMS Crocodile for Seville on Sunday April 27th, and were received there by Señor Alcain, Commissioner for Scouts in Seville, several Scoutmasters and a Troop of Seville Scouts, who escorted them to their quarters. 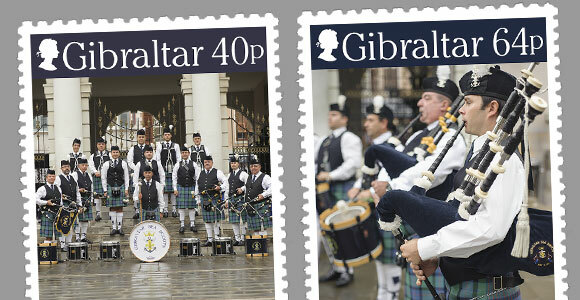 A Spanish bugle band led the column and took turn with the pipers of Gibraltar Sea Scouts, and the brass band of the 4th Gibraltar Troop in keeping up a lively flow of music ‘en route’. They witnessed the transference of the remains of the Comtesse de Paris to a Spanish gunboat for conveyance to England. All Arms of the Spanish Army were represented, including mountain batteries and some magnificent cavalry. How the Sea Scout acquired a field gun is not known. What is known is that they would tow it along to parades and use it to fire salutes. Its final fate is also a mystery. In 1920 the Pipe Band attended the World Jamboree held in the United Kingdom and subsequently at the many other international gatherings. Among its pipers it proudly records the name of Pipe Major Rob Rov, the legendary piper of Tobruk, who during his tour of duty on the rock played with the band and tutored its members. Prior to the outbreak of World War II the group moved its Clubhouse from Ragged Staff to a Floating House berthed at the Camber. This clubhouse served until 1951 when it was destroyed in the Bedenham explosion. Accommodations were then provided at Coaling Island but naval requirements necessitated their moving back to the Camber. In 1988, thanks to the efforts of Admiral Vallings, they moved into their present quarters at No. 4 Dock, HMS Rooke. The building has been aptly named ‘Vallings Cabin’. In 1976 The Pipe Band attended the International Jamborette at Blair Atholl and the Troop has participated there regularly ever since. In 1967 the 3rd Group Sea Scouts disbanded and some of its members joined the 5th Group. From this moment on the title of the Group shortened to ‘Gibraltar Sea Scouts’. During the 100 years of its existence the Group has owned a number of boats. Most famous of these is probably the ‘Eider Duck’, which was loaned to the Royal Navy for the duration of the Second World War and used by it as a tender. At present the Group disposes of numerous canes, a motorboats including The Rock Rover and a number of sailing dinghies. The Group is the only Sea Scout group outside the United Kingdom that is recognized by the Admiralty.